I always say that I don’t read or write historical fiction. That’s not strictly true, of course. I’ve read some I like very much. Until now, I’d never tried to write any. 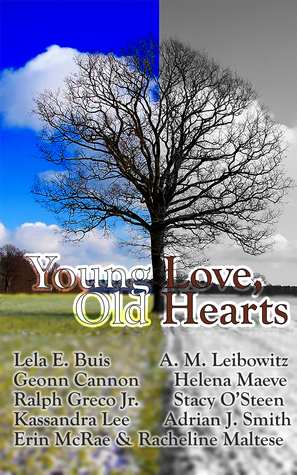 My original story for Young Love, Old Hearts was a contemporary guy-meets-guy story. I was almost done with it when a different idea struck me, and I went with it. But what does one do after an opening about two men dealing with aging and long-term care? I mean, that’s hardly romantic, even though there’s great love in caring for a partner of many years. I chose to write the middle—the interlude—as the memory of their meeting. It honestly made me laugh when I realized that the 1980s are officially a historical time period—just not one with covered wagons or corsets. Having grown up in the ‘70s and ‘80s, I’m reluctant to admit just how “historical” that era is until I meet people who weren’t even born when hair band power anthems were a Thing. I was only just coming of age in the late 1980s, but even I remember a lot of pop culture from that time. Most vividly, I recall my mother telling me I couldn’t have jelly shoes because they would ruin my feet. I also remember wearing lace gloves and an arm full of jelly band bracelets, collecting Garbage Pail Kids cards, getting my zombie groove on with “Thriller,” and learning all the words to Dire Straits’ “Money for Nothing” (I can still sing them for you, if you like). None of that appears in my story. Sad but true—I was working with adult men, so I was fairly sure they wouldn’t be sneaking the forbidden Bonne Belle lip gloss home from the corner drug store or teasing their hair into a hot mess with AquaNet. I did manage to squeeze in a few decent references to the decade, though. I’m only partly ashamed to admit I had to look up what kind of camera my character might own—I wanted to be specific. Turns out I actually owned that exact model. There are some other nice tidbits in there for readers who care to spot them. I’m a stickler for things making sense to the period and age of the characters, so for such a short story, it required intense research and more math calculations than I typically do in an average week to get their ages and dates correct. I had to know if it made sense for my character Aaron to have come to the U. S. as a child, whether he could then have served in the military, and precisely how old he would have been at every stage. I had to know similar details about the much younger character, Kenny, as well. In the course of researching, I learned a lot of things I hadn’t previously known, such as what it would have been like for a German-Jewish immigrant in the 1930s. I spent more time figuring out what their life experiences would have meant for the characters than I did actually writing the story. In the process, I discovered that it’s incredibly rewarding to write something historical. “The Artist as an Old Man” isn’t anywhere near a fun trip down memory lane to the era of big hair and bigger shoulder pads. It’s a memorial to the people who lived through the decade with a lot less campy fun than some of us were having and a tribute to people in my own family who led complicated lives during the preceding decades. I won’t say that I’ll do it again soon, but I’m no longer averse to crafting a story that isn’t set in our modern world, and it certainly opened me to the possibility that not all historical fiction must take place pre-twentieth century or even pre-1950s. Writing it gave me a taste of what it’s like to take a trip to Sometime Else for a while, and I’m glad I did it. The negotiation had been scheduled for three p.m. on Wednesday. Mr. Rubenstein’s neighborhood was a bit challenging to navigate, and Kenny arrived at two minutes past the hour. He knocked on Mr. Rubenstein’s door, his stomach in knots at meeting the artist himself. When the door opened, Kenny was met by a short, muscular man with dark hair, graying at the temples. He looked far younger than his fifty-three years. He had a long, sloping nose and John Lennon-style glasses. His face dissolved into a deep scowl, and Kenny sucked in his breath, stepping back a few paces. He slammed the door, leaving Kenny standing on the stoop, staring. Malcolm was going to kill him, and then he was going to fire him. He might bring him back from the dead just to do it all over again. Kenny gripped his hair in his hands. Nothing for it but to go home and call Malcolm. At least Mr. Rubenstein had left room for him to try again. Which ended up being exactly what Malcolm told Kenny to do, right after he threatened to not only fire him but put him on the three a.m. trucker shift. Malcolm didn’t explain how Kenny could do that if he were fired. Not in the mood for either outcome, Kenny promised to be on time the next afternoon. M. Leibowitz is a spouse, parent, feminist, and book-lover falling somewhere on the Geek-Nerd Spectrum. Ze keeps warm through the long, cold western New York winters by writing romantic plot twists and happy-for-now endings. Hir published fiction includes hir first novel, Lower Education, as well as a number of short works, and hir stories have been included in several anthologies. In between noveling and editing, ze blogs coffee-fueled, quirky commentary on faith, culture, writing, and hir family at amleibowitz.com.